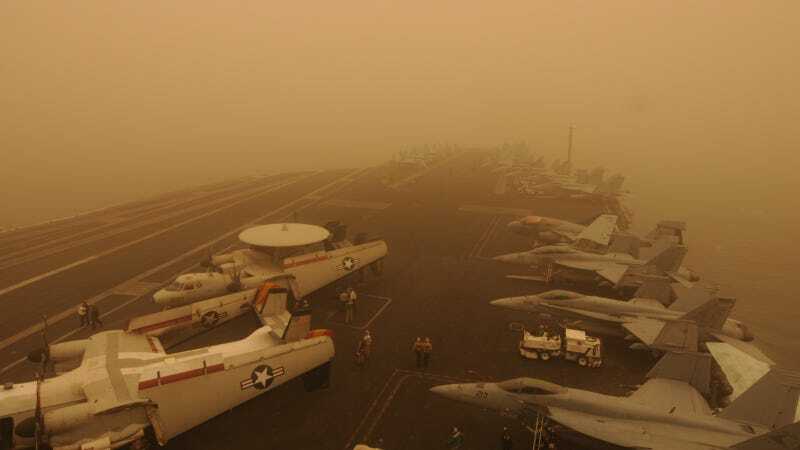 How Can This Aircraft Carrier Be In The Middle Of A Desert Storm? It looks like an airfield runway in the middle of the desert, but this is actually the deck of the the Nimitz-class aircraft carrier USS Carl Vinson. The ship was navigating across the Arabian Sea on March 19 when a powerful sand storm crossed her path. Nothing bad happened to the USS Carl Vinson, however. Just some serious visibility problems and probably a lot of clean up later.